EghtesadOnline: Iran traded 1.7 million tons of non-oil commodities worth $607.28 million with the member states of United Nations’ African Group during the first nine months of the current fiscal year (March 21-Dec. 21) to register a 14.27% and 18.38% fall in tonnage and value respectively compared with last year’s corresponding period. Latest data released by the Islamic Republic of Iran Customs Administration show Iran’s exports totaled 1.63 million tons worth $513.51 million during the period under review, indicating a 13.96% and 6.86% decrease in tonnage and value respectively year-on-year. Imports stood at 76,532 tons worth $93.76 million, down 20.32% and 51.34% in tonnage and value respectively YOY. The African Group is one of the five regional groups in the United Nations. The regional groups are unofficial bodies that act as voting blocs and negotiation forums. The African Group is the largest group, with 54 members and 28% of the votes in the UN General Assembly, and encompasses all the independent countries of its namesake continent, according to Financial Tribune. The United Nations Regional Groups are the geopolitical regional groups of member states of the United Nations. UN member states are divided into five regional groups: the African Group, with 54 member states, the Asia-Pacific Group, with 53 states, the Eastern European Group, with 23 states, the Latin American and Caribbean Group, with 33 states, the Western European and Others Group, with 28 states, plus 1 member state (the United States) as an observer state. Iran mainly exported non-alloy semi-finished iron/steel products, bitumen, liquefied butane, non-alloy iron/steel ingots, sodium hydroxide and urea to the African Group. In exchange, major commodities imported into Iran from the member states included pod vegetables, aluminum oxide, sesame seeds, amalgams, strip-bellied bonito and yellowfin tunas. In terms of trade value, Egypt topped the list of countries in African region with Iran trade standing at 502,563 tons worth $217.64 million, down by 3.5% in tonnage and up by 31.19% in value YOY. In fact, Egypt was Iran’s 32nd major trading partner in the world during the nine months. Exports to Egypt amounted to 502,135 tons worth $215.53 million to register 4.94% decline in tonnage and 31.26% rise in value YOY. Egypt was Iran’s biggest export destination in the group and 16th in the whole world. In return, Egypt exported 427 tons of commodities worth $2.1 million to Iran, down by 80.98% and 55.16% in tonnage and value respectively YOY. Egypt was the 11th exporter of goods to Iran from among the African Group and 90th in the world. Major Iranian commodities exported to Egypt were non-alloy semi-finished iron/steel products, non-alloy iron/steel ingots, methanol and ethylene glycol. For its part, Egypt mainly exported blade, safety razors, smoking pipes and stabilizers to Iran. Kenya was Iran’s second biggest trading partner in the African Group during the nine months as two-way commercial exchanges stood at 248,295 tons worth $80.58 million to register a 1.01% growth in tonnage and 16.27% decrease in value YOY. Kenya was Iran’s 52nd major trading partner in the world during the period. Iran exported 246,605 tons of goods worth $73.63 million to Kenya, up by 13.74% in tonnage and down by 1.9% in value YOY. Kenya was Iran’s second top export destination in the region and 32nd in the world during the period. Iran’s exports to Kenya included bitumen, liquefied butane and liquefied propane. Sudan was Iran’s third major export destination, after Kenya, in the African region and 39th in the world, as Iran exported 94,359 tons worth $38.7 million to Sudan during the nine-month period, down by 33.92% and 30.39% in tonnage and value respectively YOY. Iran mainly exported non-alloy semi-finished iron/steel products, bitumen and paperboard to Sudan. Iran imported 1,689 tons of commodities worth $6.94 million from Kenya, up 30.58% and 47.18% in tonnage and value respectively YOY, a majority of which comprised tea, vegetables and coffee. Kenya was the fourth exporter of goods to Iran among member states and 74th exporter to Iran in the world. Mutual trade between Iran and South Africa amounted to 94,837 tons worth $45.16 million, indicating a 28.72% increase in tonnage and 13.92% decrease in value YOY. South Africa was Iran’s third major trading partner among member states and 61st in the world. Iran’s exports reached 90,606 tons worth $32.11 million, up 39.76% and 17.66% in tonnage and value respectively YOY, while South Africa’s exports to Iran reached 4,253 tons worth $26.57 million, down by 8.39% in tonnage and up by 18.54% in value YOY. South Africa was Iran’s fourth export destination as well as the third exporter of goods to Iran in the African region. The country was Iran’s 44th export destination and 50th exporter to Iran in the world. Sodium hydroxide, urea, floorings and bitumen were Iran’s main goods exported to South Africa, while South Africa exported mainly amalgams, coke and steel products. This is while Swaziland was the top exporter of goods to Iran in the African Group during the nine months, as Iran imported 30,782 tons of commodities worth $20.65 million from Swaziland, indicating a 3,601.90% and 243.89% hike in tonnage and value respectively YOY. Iran mainly imported aluminum oxide and plastic products from Swaziland. Swaziland was the 54th exporter of goods to Iran in nine months in the world. Ethiopia was the second top exporter of goods to Iran, after Swaziland, in the African region and 57th in the world, as Ethiopia exported 17,657 tons worth $19.7 million to Iran during the nine-month period, down by 38.67% and 34.71% in tonnage and value respectively YOY. Ethiopia mainly exported pod vegetables, sesame seeds, pinto bean and coffee to Iran. 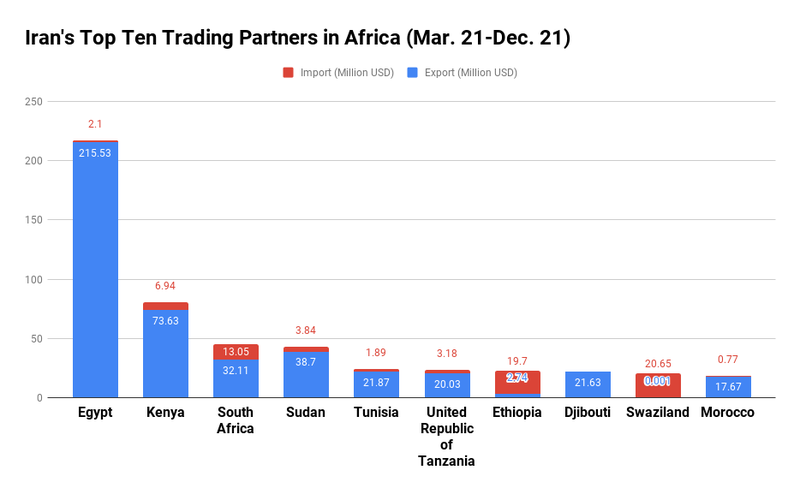 Trade with Rwanda ($1.13 million), Swaziland ($20.65) and Niger ($1.07 million) saw the highest YOY growth of 4,177.46%, 243.91% and 106.57% respectively, while trade with Central African Republic ($996), Togo ($2.28 million) and Guinea ($182,513) witnessed the lowest decline of 99.98%, 95.93%, and 88.42% respectively. Iran’s exports to Rwanda ($413,722), Tunisia ($21.87 million) and Morocco ($17.67 million) saw the highest growth of 1,462.98%, 144.7% and 107.03% respectively, while exports to Central African Republic ($996), Togo ($2.28 million) and Guinea ($182,513) witnessed the highest decline of 99.98%, 95.93% and 88.42% respectively. Imports from Uganda (at $371,043), Swaziland (at $20.65 million) and Kenya (at $6.94 million) saw highest growths of 328.86%, 243.89% and 48.49% respectively, while imports from Ghana ($6.69 million), Seychelles ($4.66 million) and United Republic of Tanzania ($3.18 million) witnessed the highest decline of 84.98%, 77.04% and 74.87% respectively.